The Sprinter’s “Audio 15” stereo system has an interface from the mid-90s, and speakers that sound like they are made from wet toilet paper. Sane people would just replace the whole lot, but we experimented with keeping the head unit and seeing what a difference good speakers would make. When that didn’t give us quite enough improvement, we swapped out the head unit for something that produces clearer sound and connects better with our phones. This is an overview of the different articles we’ve written about our attempts to get good sounds inside the van. If you’re trying to do the same thing, start here. Adding an aftermarket head unit (replacing the Audio 15 stereo). Adding new speakers in the doors and dash. Adding rear speakers and a switched amplifier to listen to music when we’re parked. Adding a subwoofer that uses the stock speaker wires for input. Sound deadening and insulation in the van. The rest of this post gives more details on the what and why. Normally we’re really happy to accept that the Sprinter is a work van, and so it doesn’t have the fit and finish or luxury items you’d associate with passenger cars. However, we’d have thought that good tunes rank pretty highly on most commercial drivers’ lists of wants. When we rented a bottom-of-the-line Ford car and found it had far, far superior sound compared to the van, we realized it was time to do something about the sad lack of music we were suffering from. There is no getting around the fact that Sprinters are big metal boxes and pretty much any stereo system is going to struggle to fill the space with music given the engine, road and wind noise that the van generates. But you can do better than what comes stock in the vehicle. Our Sprinter had the Audio 15 stereo system installed. It’s not what we’d call a premium audio unit. 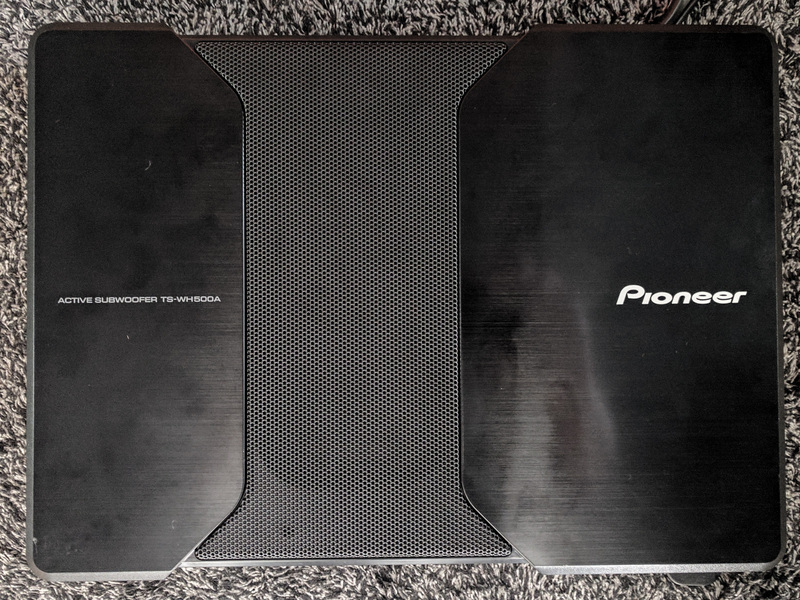 It has very little in the way of amplification, its interface is hard to use, and it really struggles to play music from USB or SD card sources because it takes forever to catalog the available songs and sometimes just gives up and plays stuff from the first three or four folders while ignoring the other ones. The van came with a built-in Becker GPS system that we didn’t order and didn’t want. The interface is terrible, the maps aren’t clear, and it costs $99 each time you want to update the built-in map data. Its only benefit over, say, Google maps is that it will work even if you don’t have a data connection. For that reason alone we initially decided to keep the stock head unit and just upgrade the speakers around it. The van came with two front speakers in the doors, two “tweeters” in the front corners of the dash, and a voice coil in the middle of the dash. All of them sound terrible. Any attempt at adding bass using the equalizer just makes the music muddy. It’s impossible to listen to anything other than spoken word recordings while the van is moving because the engine and road noise drowns out the mid-level tones most music relies on. The easiest upgrade, and the one with the most benefit, is to replace the dash and door speakers with ones which cost more than $1.50 to manufacture. We chose some Hertz Audio DSK 165.3 6-1/2″ 2-way Dieci Series speakers. You can see that they have the 6-1/2″ door speakers (“woofers”) and also 1″ dash speakers (“tweeters”). The other box is a crossover. The single wire from the stereo goes in, and the box separates out the frequencies that the tweeters can play from the frequencies that the woofers can play. That way you get brighter tones from the tweeters and fuller sound from the woofers. These speakers are too big to fit in the metal holes in the door panels. Luckily Hein, one of the Sprinter Forum members, has created CNC-ed plastic adapter rings that bolt to the speakers and to the door. Miraculously, these speakers still fit OK behind the stock interior skin of the door. See our full install process for details of how they fit. This is by far the easiest upgrade and provides the best improvement for the least cost. Even with the stock stereo unit driving these speakers, the sound quality is miles better. Still not awesome though. Even with upgraded speakers, the low end was still missing from the music we were playing. We bought a (relatively) cheap powered subwoofer that’s designed to fit under the seat in most cars. It slots well into the back of the passenger seat base – even the lowered base that we have in our van. It’s not going to blow the windows out with its power, but then we aren’t trying to wake the neighborhood up with our wub-wub-wubbing dubstep bass drops. 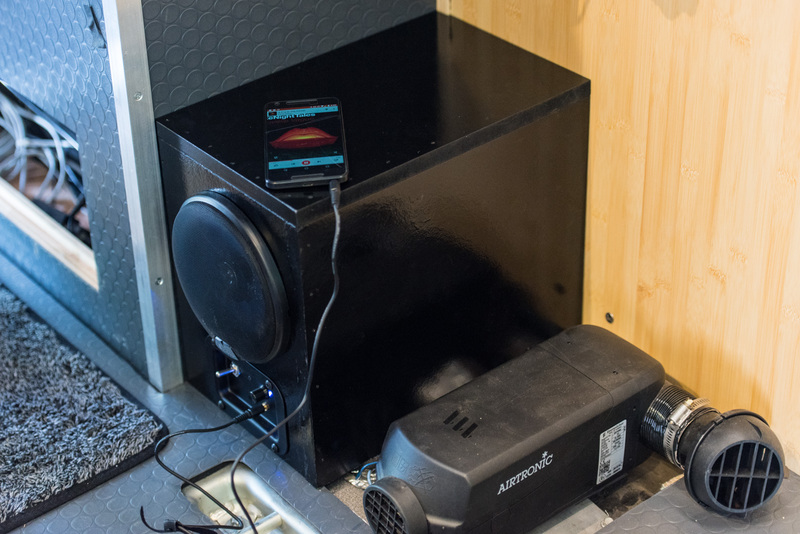 Here’s our subwoofer install process if you want to follow along at home. The head unit is equipped with a fader control. It’s only enabled for the passenger vans, which have additional speakers in the back. It’s possible to get Mercedes dealerships (or anyone else with the STAR/Xentry system) to enable the fader control. That way, you have the option of adding speakers further back in the van as well as at the front, and being able to control the relative volume through the head unit. Unfortunately the harness from the back of the head unit doesn’t have pins installed for these rear speakers. Check out the thread on the Audio 15 on the Sprinter Forum for the various methods people have used to add the rear speaker cables. We didn’t bother adding pins to the factory harness. We only installed rear speakers when we changed out the head unit for an aftermarket one. At that point, we added some extra speakers in the wall panels by our passenger bench seat in the third row position. We also added a dual-throw four-position switch so we could either have these rear speakers connected to the van stereo in the front, or use them with a second 12v amplifier and a phone or MP3 player while we are camped. This second amplifier is powered by our house batteries, so our music won’t run down the starter battery. 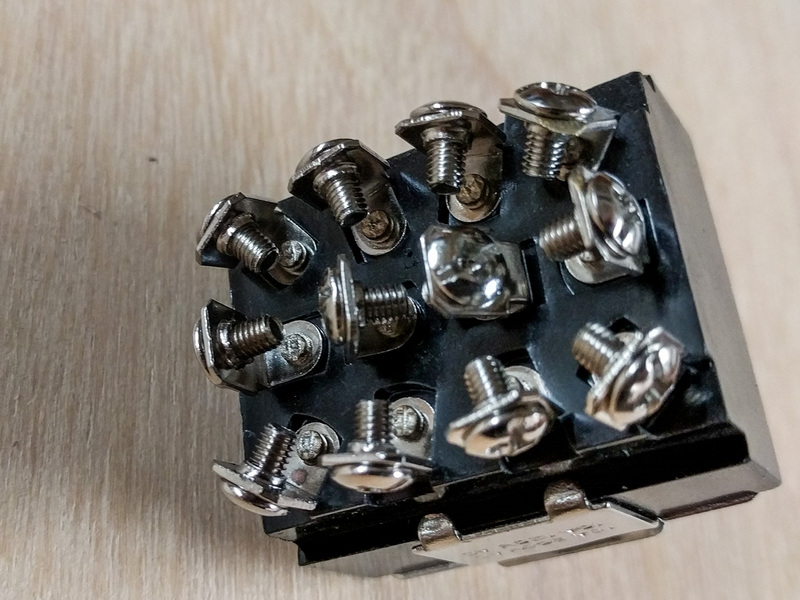 The back side of the dual-throw four-position switch for rear speakers. This lets us switch between the van stereo and a small amp in the back. Temporary rear speaker placement with the amp controls underneath it. The Becker GPS didn’t turn out to be very reliable for us. We’ve found that the stock stereo’s FM reception is also terrible. Even with the speaker upgrades the stock head unit just wasn’t meeting our needs. In the end, we decided to junk the Audio 15 and replace it with an aftermarket stereo head unit. We chose the Sony XAV-AX100 (Amazon link). It has a clean interface, and minimal flashiness. Sony XAV-AX100 stereo home screen. Your new stereo also isn’t going to plug straight into the socket that the factory radio uses. You’ll need a wiring harness adapter and you’ll probably have to strip and crimp several cables to join everything together properly. We wrote a long post on what we did and how we did it. 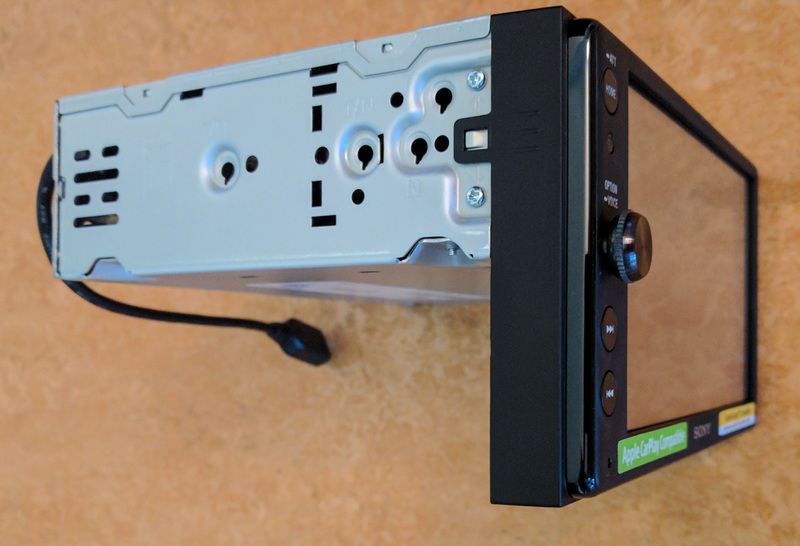 There should be enough detail in this post that you can follow along even if you choose a different head unit than the one we did. Stopping outside noise from getting in means the stereo doesn’t have to work hard to overpower that noise. 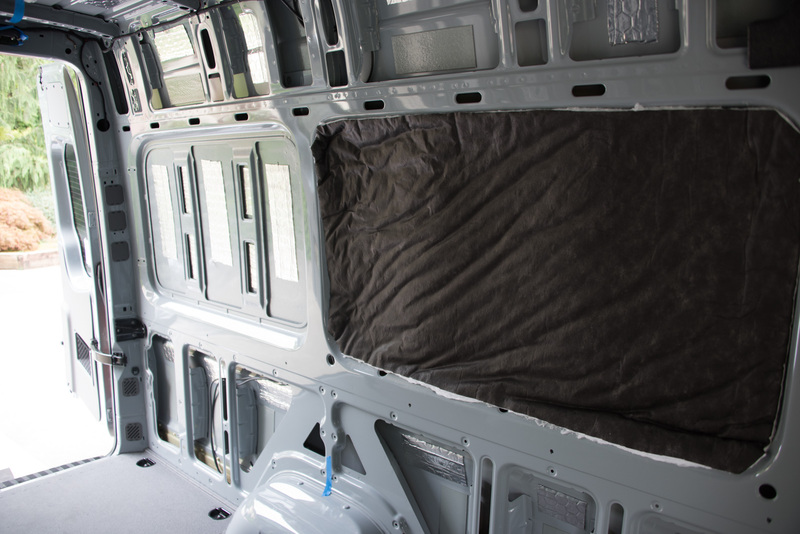 We used butyl sound deadening on some of the van panels and then covered everything in Thinsulate automotive insulation. That’s a noise and heat insulation layer in one. It does a pretty good job of reducing road noise inside the vehicle. We also have a 3/8″ thick rubber stall mat covering the whole floor of the van to act as a damping layer. You can see more about how we insulated the van in this post. The “Audio 15 head unit reference” thread started by Avanti on the Sprinter forum is a great source of information and confusion. Crutchfield have a stereo configurator based on your vehicle. we’re not 100% sure it gave us the best options for wiring harness adaptors, etc. but it’s a good starting point. Even with the discount they offer on accessories, it’s worth checking overall prices on Amazon. It depends whether you want to pay for the insurance of knowing you can call for installation help. Did you guys do anything about the Navigation? Also, did the new unit improve the reception? By any chance did it improve the reception of the key fob to lock/unlock the van. I have to be within a couple feet to get the doors to lock, but I guess thats another issue. Adam, the head unit we bought has Android Auto integration so we use Google Maps for navigation. The map appears on the head unit and gives voice commands over the stereo speakers. You can say “OK Google” to search for locations or give it a destination address. It needs an internet connection but you can get around that by downloading the map data for an area of the country to your phone before you lose reception. The option is in the Google Maps app. It’s called “Offline Maps” on the main menu. The new head unit did NOT improve reception. We were considering buying a head unit with HD radio. That would probably work a lot better because it’s a digital signal. 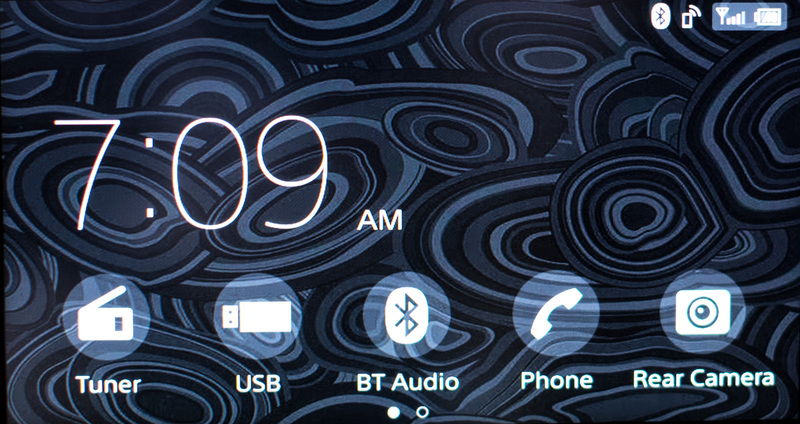 The key fob reception has nothing to do with the head unit or the rest of the stereo. If you are having problems with your fob, try pushing it for a longer period of time. It often needs a longer push rather than just a short tap. Also, make sure you aren’t pressing the fob buttons accidentally while the fob is in your pocket, because that will wear the batteries down and reduce the fob’s range.